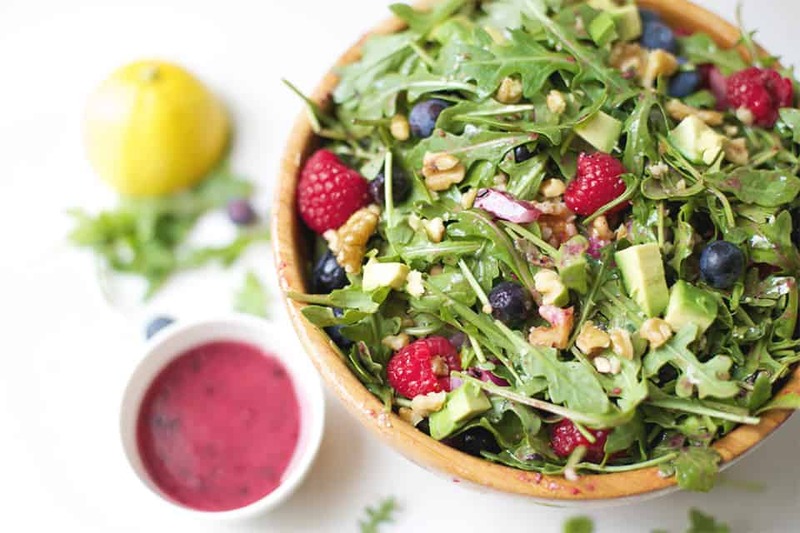 Superfood Salad combines so many powerful antioxidants and nutrients, and is dressed up with a Blueberry Vinaigrette! 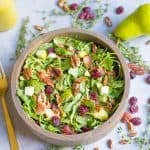 This spring salad is sure to please a crowd or makes a delicious side dish or lunch. With all of the yucky illness floating around, I figured a superfood antioxidant boost is just what we all need. I like to think of this bowl of goodness as my medicine. Feeling a cold or some ickiness going on? Grab a bowl of this!! 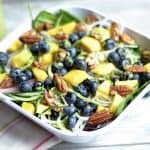 You’ll also love the way the Blueberry Lemon Vinaigrette adds so much depth and tangy fruity flavor. 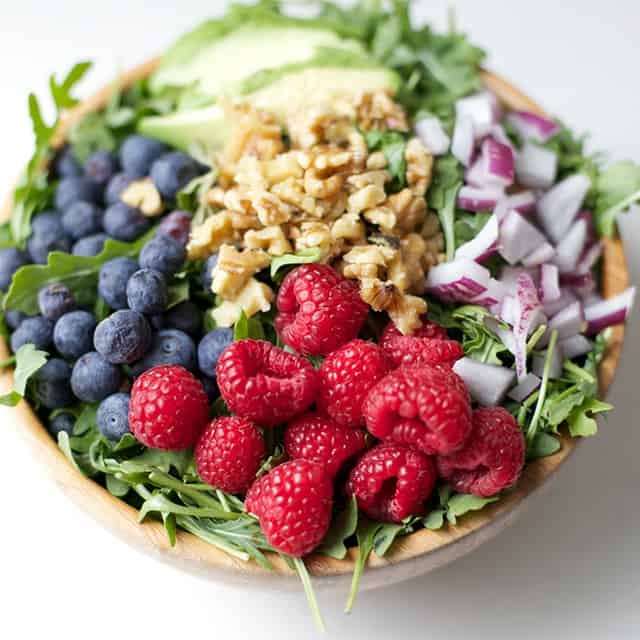 I’ve combined so many delicious superfoods: arugula, raspberries, avocados, walnuts, blueberries, and red onion. So much fruity lightness with a delicious texture of crunchy walnuts and avocado. 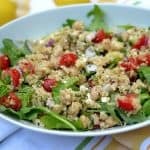 This salad is easy customizable too: make a it a complete meal by adding in your favorite source of protein, or toss in some more vegetables. You can also switch up the greens. Arugula is my absolute FAVE, but spinach or kale would also be a great addition. In a large bowl, pile in your greens (make sure they are rinsed) into the bowl. 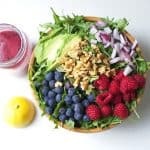 Now top with berries, avocado, and red onion. 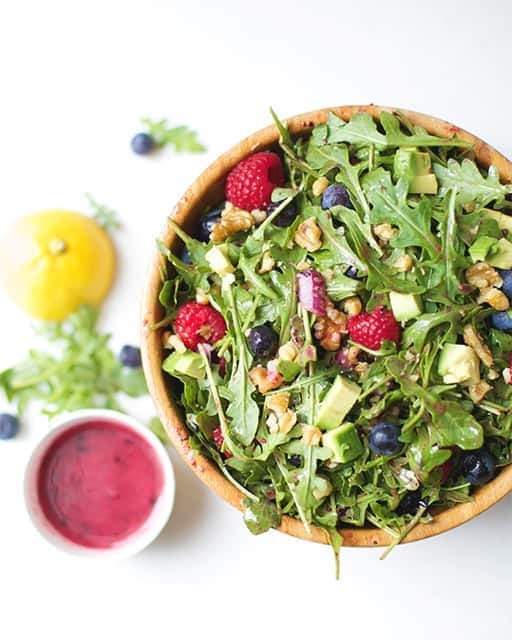 Make your dressing: begin by adding in 1/4 cup avocado or olive oil, blueberries, lemon, lemon zest, apple cider vinegar, dijon mustard, and basil. Pulse in a food processor or high powered blender for 1 minute. After 1 minute, while motor is running, pour in remaining oil. 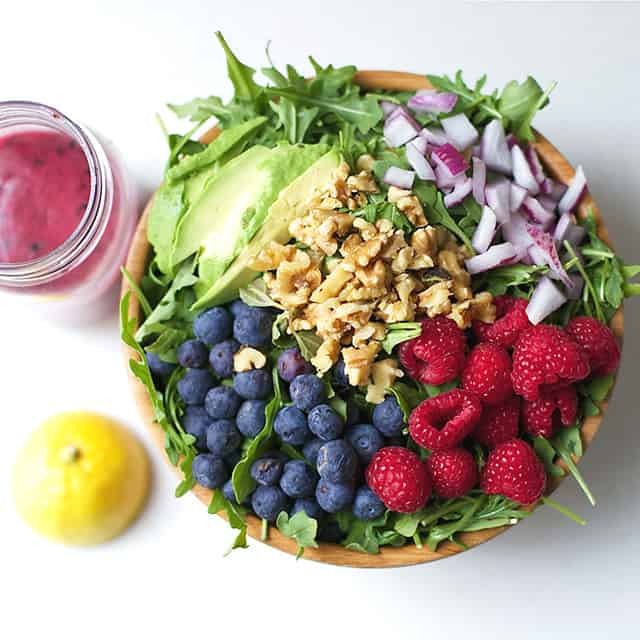 Continue to pulse until dressing is well combined, and blueberries are completely incorporated. 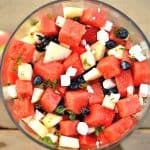 Toss dressing onto the salad (you may not use all of it and have extra), and carefully toss all ingredients of the salad with the dressing. Finally, top with walnuts and serve.